Today I've got a great indie polish to review! 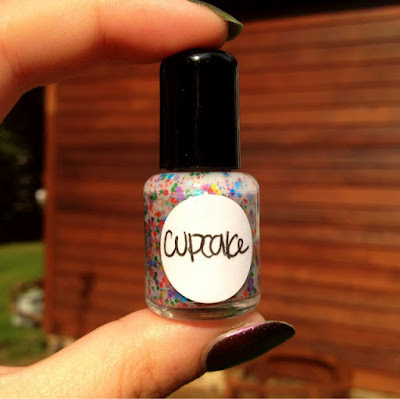 This is Imperial Nail Lacquers Cupcake! 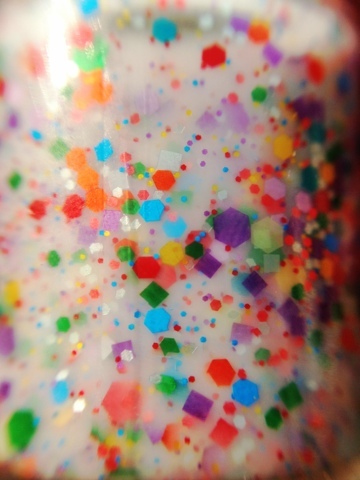 This gorgeous, white jelly base is suspended with all sizes and shapes of fun sprinkle like glitter. I've got the mini size of Cupcake which you can find on her Etsy store for $5 or request a full sized polish for $9. Check out this fabulous macro! You can really see the diversity of the glitters in here! We've got mini hex glitters as well as medium hex and squares and large hex of every color! Finally the swatch! This is one coat of Essies Blanc with two coats of Cupcake. Cupcake applied wonderfully and was loaded with glitter in every stroke. I didn't need to use any dabbing to disperse it evenly. One coat would have been enough but I wanted to go two for maximum glitter! If you'd prefer a slightly translucent look you can just use Cupcake alone and have a slight visible nail line. 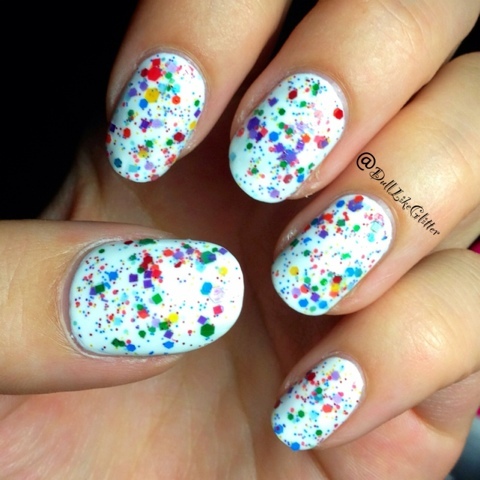 Its like funfetti for your nails! Imperial Nail Lacquers is ran by @prettycutepolishes on instagram or you can check out her store using the link above or go to www.etsy.com/shop/imperialnaillacquer. Imperial Nail Lacquers sells most of her minis for around $5 and you can request any of her colors in full size for $9! She even has some awesome dupes of hard to find polishes like Lynnderellas Connect the Dots and Love, Lace & Lilacs. I would love that! Thanks again for sending me Cupcake! It's one of my favorite glitters!